Yesterday morning the ground was covered with sleet again. It had been snowing in the night time, but by 9am the temperature had risen few degrees above zero and the sun was sending its rays through the clouds, warming up the ground and trees and all, melting the snow away, turning sleet into plain water. 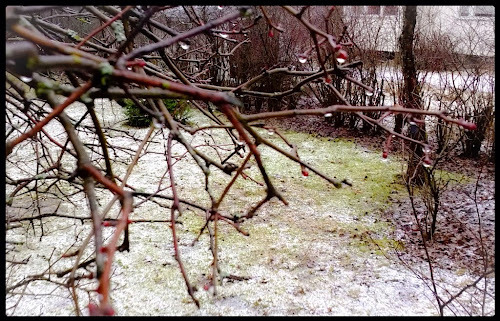 Snow on trees and bushes had already melted into droplets of water hanging heavy until they finally fell on the ground. The rest of the day was sunny but windy, until late afternoon when the clouds rolled in again.